Quite often I am asked can a Rollback be triggered in Release Management if a user rejects a step of the release. By default rejecting a step of the release will simply stop the release but will not rollback the system to a previous state. However, you can use the Manual Intervention action to achieve the desired effect. 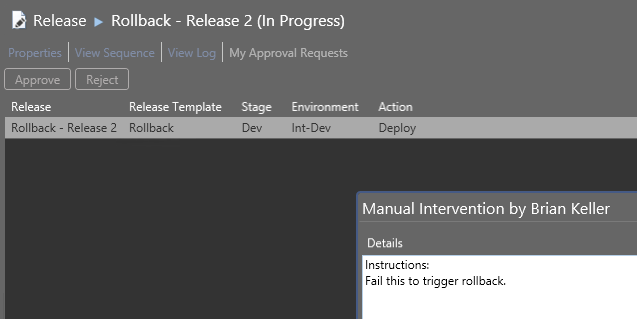 To trigger a rollback based on user input simply add a Manual Intervention action at the bottom of your stage’s Deployment Sequence. If the Recipient rejects this Manual Intervention all the identified Rollback sequences will be executed.